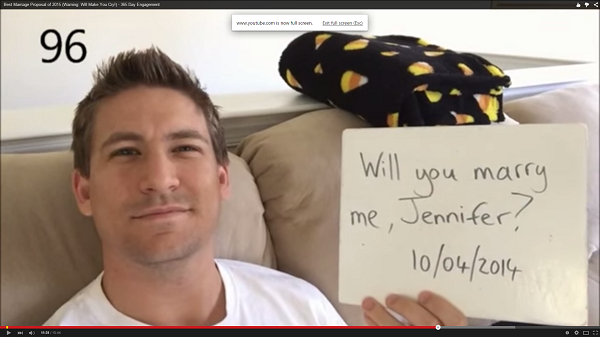 You have to watch this adorable 365 day proposal video- we dare you not to cry! 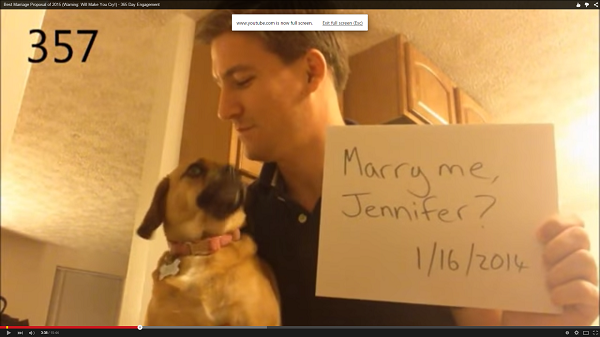 If you haven’t seen the most talked about proposal this year, then where have you been? The video which went viral since it was posted on January 18th shows Arizonian man Dean Smith secretly proposing to his girlfriend over 365 days. Dean decided that he wanted to propose to his girlfriend the year before and thus started the 365 day long proposal project. 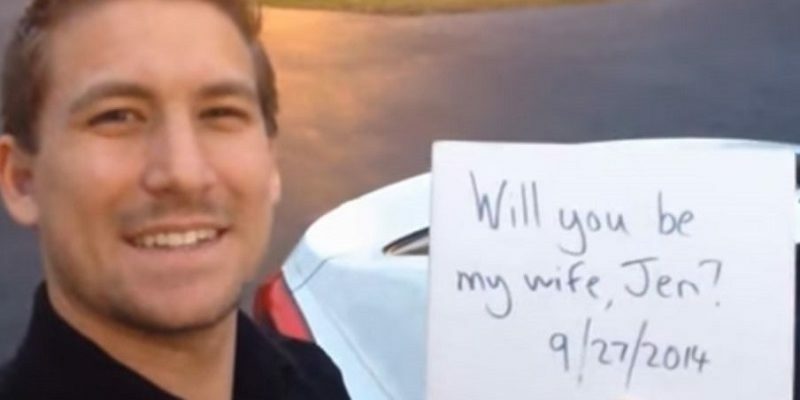 Every day without fail the dedicated man filmed himself holding a white board with messages like ‘Will you be my wife Jen?’ or, ‘Will you make me the happiest man in the world?’ alongside the date to prove he was actually proposing each day. The video features Dean holding the white board while doing menial tasks like brushing his teeth and skateboarding to demonstrate that the thought was in his mind each day. To finally let Jennifer in on the proposal Dean ropes in the help of her family while on holiday in Aruba, a trip which overlaps with the future bride’s birthday. Using yet more white boards he has her brother and sister direct her to the beach where her parents present her with a tablet to watch the video Dean has produced over the last year. 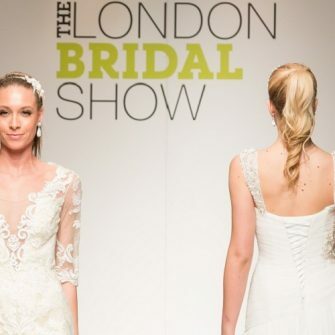 A crowd gathers to watch the spectacle and as the video finishes he asks her to turn around where they embrace and he gets down on one knee to propose. The YouTube clip has had mixed reviews while most Twitter users brand it ‘adorable’ and ‘cute’ others have said it was a waste time and that he should not have waited a year to propose. In an interview with Huffington Post Smith remarked that he made the video because his future bride loved online proposals and he vowed to make her one of her own. 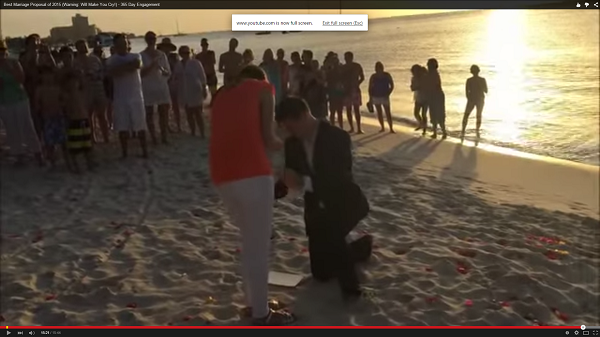 We’re not going to pretend that such a thoughful, romantic proposal didn’t make us cry. 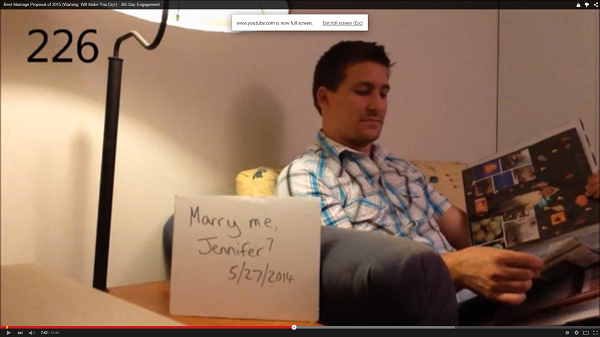 So would you have liked a proposal like Jennifer’s or are you have happy with your story? 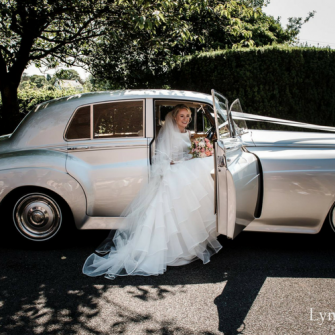 Share your very own proposal stories on our Wedding Journal Online Facebook page!